The next time you’re looking for a new way to cook seafood, consider the past. 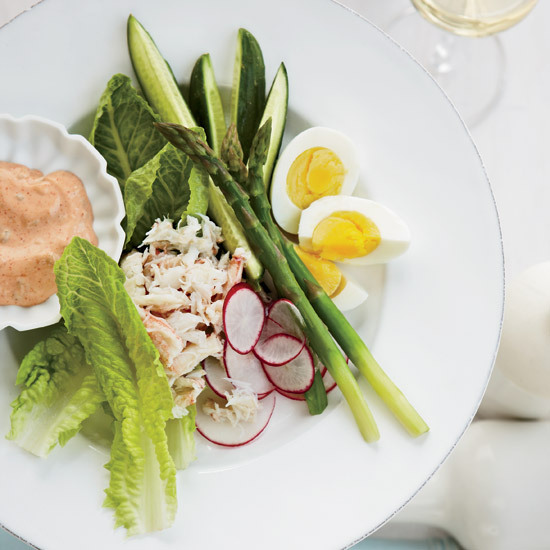 Retro seafood recipes like shrimp cocktail and Crab Louie have stood the test of time for a reason: They’re straight-up delicious. Here, eight old-school seafood recipes to revive and love. Crab imperial is a classic Maryland dish made with blue crab bound in a mayonnaise-based sauce. In this recipe, chef Michael Mina replaces the mayonnaise with hollandaise, for an even silkier spread. This renowned baked oyster dish was created at Antoine’s Restaurant in New Orleans in 1899 by the proprietor, Jules Alciatore. According to legend, the dish was created as a substitute for baked snails, which were hard to obtain. It was named in honor of John D. Rockefeller, at the time one of the world’s richest men, because of the sauce’s intense richness. Also known as the King of Salads, this West Coast specialty dates back to the early 1900s. It’s made with sweet Dungeness crab, lots of crunchy vegetables and a tangy Louie sauce. Chef and Food Network Canada star Anthony Sedlak spikes the ’70s throwback Marie Rose sauce (mayonnaise with a touch of ketchup) with brandy and horseradish. Chef Andrew Zimmern swears this kind of old-school dish is making a comeback. “You should get on the bandwagon before you are labeled a culinary poseur by all of your friends,” he says. A throwback tiki bar appetizer, crab Rangoon are deep-fried dumplings stuffed with cream cheese, crab and, in the case of this recipe, a sweet-and-sour cranberry chutney. While it’s traditional to make tuna noodle casserole with canned condensed soup, it’s much better with a silky, homemade cream cheese sauce. Newberg, with its sherry-spiked cream sauce, seems like a throwback to the Eisenhower administration, but this ultra-rich dish is so delicious it transcends trends.